This luxury villa is located in the Beach Tower (closest tower to the ocean and beach) on the 5th floor in the stack next to the end cap ocean front villas. It has been professionally decorated and furnished. You'll be impressed with the spectacular oceanview from every room. The spacious lanai is accessed through not only the living area but also the master bedroom. The sliding glass doors open allowing the living area to become part of the lanai. The lanai also overlooks the amazing lagoon style pool. The spacious villa is 1,486 square feet and has a king size, queen size, two twin size beds (option to combine together) and a queen size sofa bed. Ko Olina Development: A new resort will be developed between Aulani and Ko Olina Beach Villas. No commencement date has been provided. This villa does not have a direct view of the future resort's development. - Free local and long-distance calls within the U.S.
- Access to all resort amenities including 24 hr guest services, concierge, fitness center and more! The Beach Villas at Ko Olina is the first private resort on Oahu in 25 years. The resort is located along the sunny western coast just 20 miles from downtown Honolulu and 27 miles from Waikiki. Located among four lagoons, swimming, snorkeling and sunbathing is just steps away from the resort. The nearby marina provides numerous opportunities such as whale watching and scuba diving. The J.W. Marriott is just next door providing various restaurants to choose from. For golfers, play the championship golf course designed by Ted Robinson and home to the LPGA. 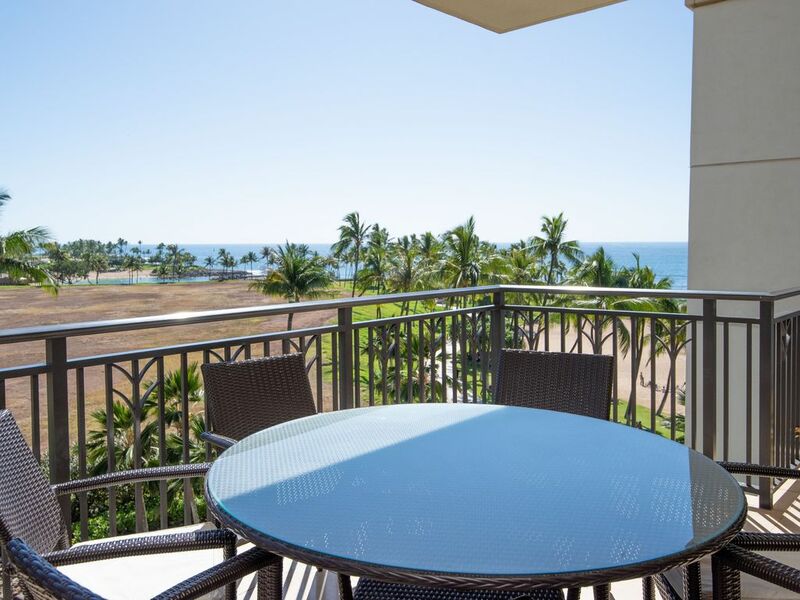 The Beach Villas at Ko Olina located on Honu Lagoon (lagoon two) is becoming the favorite choice for vacations. Ko Olina Beach Villas is an amazing resort that's new to the area! It's located close enough to Honolulu allowing easy access to the airport and to the shopping and beaches of Waikiki. Conveniently just steps away from the resort is the lagoon and sandy beach. This lagoon is calm and great for swimming as well as for children wading in the water. There's even fish to see for those who love to snorkel! The four lagoons along the coast are connected together by a sidewalk providing a pleasant walking excursion and allowing easy access to the various restaurants. This resort just has it all for a laid back Hawaii vacation of doing nothing but enjoying the sun and beach and for those wanting to be tourists and enjoy the adventures Hawaii has to offer. Our guests have full access to all amenities at the resort. We have a property management company on site to assist our guests during their stay. We also own 3 other villas in the resort to accommodate guests that may require multiple villas for their vacation. Beach/Pool towels provided by resort. We had a great time staying at the Beach Villas at Ko'olina. It is a great location and the unit provided lots of beach toys, boogies boards, floaties, beach towels, etc. The unit is very nice with plenty of room for multiple families to share. The only complaint is that the dryer did not work very well - it would take hours and hours to dry towels, which is quite inconvenient when we're going to the beach in the morning then would need the towels again in the afternoon for the pool. Also, a vacuum would've been nice - there was a broom provided, but it was hard cleaning up all the sand that gets tracked in from the beach. Other than that, our stay was great! Would definitely return. We returned to this property for the second time. Loved the room, the property and the lagoon just as much as last time! Beautiful condo in great location on peaceful lagoon #2. Three bedrooms suited our 5 adults perfectly; each with a separate bathroom. There were almost too many dishes in the well equipped kitchen. I do agree with other reviewers that the weak link is laundry. The washer and dryer are very small and it takes over 4 hours to finish one load. Overall though, it’s a wonderful place and I would definitely rent again. We normally stay at the Marriott vacation club in the other lagoon but they were sold out so we looked elsewhere in KoOlina. I’m so glad we booked this 3 bedroom suite. It was perfect for my family and 3 kids as well as my sister and her family including a toddler. The place itself is modern, spacious and fully stocked of things in the kitchen and activities to do in the water and on the beach! Loved the pool and location on lagoon. Michael and Susie were great virtual hosts and checked in on us prior to check in and gave us great detailed info. We will absolutely book here again!! We had such a wonderful stay in BT507! It had such a great view of the ocean and was so well stocked. We loved the space we had and that every room had their own bathroom - big bonus! Susie was great to work with and was very accommodating with needs. They have so many beach supplies in the closet - coolers, boogie boards, tons of snorkeling equipment, umbrellas, etc. We left a few items we had purchased - you won't need anything more! The property was beautiful - we loved the pools. The lagoon is really the best in Ko'Olina - the least busy one. We walked to the others and were grateful that we chose to stay here rather than the Marriott or Disney. Those lagoons were packed with people - we felt like ours was private! The only difficulty we had was the washer and dryer were small and took a very long time but it was nice to have them! If you're on the fence about this property, BOOK it! We'll stay here whenever we're back. Thanks Susie & Mike for sharing! Pros: Kitchen is fairly well equipped. Spacious living space and great ocean views. The pools are well kept and wonderful. You are also on the beach. The workout room is great too. We also had massages inside the condo which was great! Yana is fabulous. This is not the crowded Aulani or Marriott!! Costco is 4.5 miles away! We would absolutely stay again. Cons: This area is an airline path for both commercial planes and military. It's loud and goes on all day. You have to walk half a mile to get a latte and the pool bar doesn't serve appetizers or lunch. The washer and dryer take a super long time....hours and hours so be prepared. There were a few other condo complaints but we let the owner know. We would love to stay here again! 50% due at time of booking Remaining 50% due 45 days prior to check-in No parking fee Owner's Cancellation Policy per Rental Agreement: For Non-Holiday Season: No refunds for cancellations made 45 days or less prior to arrival date. 50% of the rental amount (less $100 cancellation fee) will be refunded for cancellations made 90 to 46 days prior to arrival date. Full refund for cancellations made 91 days or more prior to arrival date. Changes in dates resulting in an early departure that are made within 45 days of the arrival date does not warrant any refund of rental amount. For Holiday Season: No refunds for cancellations made 90 days or less prior to arrival date. 50% of the rental amount (less $100 cancellation fee) will be refunded for cancellations made 120 to 91 days prior to arrival date. Full refund for cancellations made 121 days or more prior to arrival date. Changes in dates resulting in an early departure that are made within 90 days of the arrival date does not warrant any refund of rental amount.